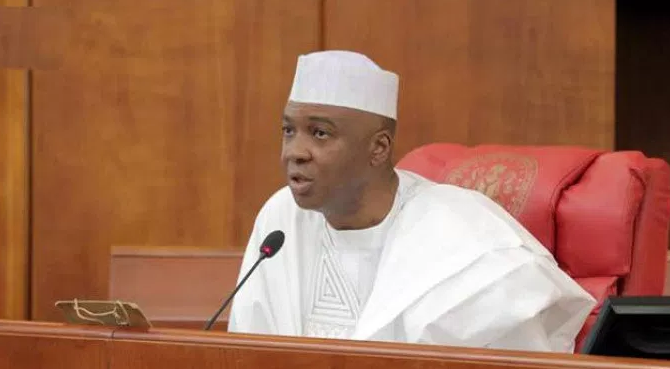 A Civil Society Organisation, Survivors in Support of Education (SiSE) has applauded the Senate President, Dr. Abubakar Bukola Saraki, for his donation, which led to the construction of classroom facilities in the Abagena Internally Displaced Persons (IDP) Camp in Benue State. The National Coordinator of SiSE, Hamza Abudullahi, in a thank note, according to a statement by the Media Office of the President of the Senate, commended Saraki for his unexpected donation of N8million, which led to the provision of Two Classroom blocks of Four classes each for the 40,000 person capacity camp. “Before now, the children in the camp had to learn under makeshift sticks and grass tents, which made the environment not conducive for learning. Imagine a situation where six, seven and eight year olds had to learn under such conditions. They were always pummelled by the weather. “But when the Senate President visited the camp on Children’s day, the State Governor, Samuel Ortom, took him around the camp and showed him the facilities that existed. Saraki then insisted on speaking to some of the children, who told him about the classroom situation. Many of us that were there that day thought that it would just be another photo-op opportunity,” Abdullah said. The SiSE coordinator mentioned how it took everyone by surprise when Saraki announced a donation of N8million of his personal money before he left the camp on May 27th, 2018. “To be honest, we were not expecting him [Saraki] to do that. He did not have to, but he did. His donation of N8million went to building the classrooms and ensuring that the children now have a more conducive learning environment. Of course, we can’t even begin to talk about how the building process helps to create work opportunities for some of the young men in the camp. For this, we thank His Excellency for this noble and kind gesture, only Allah in his infinite mercy and grace can reward this kind act towards the IDPs in Benue State,” SiSE said.